A number of job seekers fail to realize the secret behind obtaining a job quickly. To get hold of the minds and hearts of employers a legion of qualities is mandatory. Do you know what skills are required for an applicant in order to get recruited? Apart from the position, employers look out for certain technical skills in an applicant for being hired. Learning the latest technology and gaining knowledge is not the only skill an employee should possess there are certain factors beyond it which employers are looking for. Here are a few hints which showcase the skills an applicant should possess in order to get hired. To invade into new customer sources, nearly all industries make use of social media power. The procedure is being tried to make quicker, cheaper and efficient by discovering new technologies. A few social media sites are Facebook, Twitter, Youtube, LinkedIn, Digg, Google+, Stumbleupon and more. Employers believe their employees to know the method of navigation into two or three of social media networks. Marketing roles are keen on this and would like their employees to possess knowledge of social media sites. Employers desire job questers to be well versed with video skills as it is mandatory for global communication. YouTube is the basic video which everyone is aware of and one should know the skills and tools involved in it. Moreover the employees should also update themselves with latest technologies related to video skills such as Skype, other video chat rooms and video conferencing. Employers are looking for candidates who possess sound knowledge in software skills. Job seekers should be talented in the latest software that is hot presently. Though employees are unaware of the latest technology, they can showcase their talent about their past achievement and experience. When candidates possess the ability to work they also have the tendency to learn new technologies in future. For development and modification of web pages knowledge of HTML is mandatory. Troubleshooting as well as system maintenance tasks can be taken upon by employees well versed with HTML basics. Communication issues with internal and external clients can be fixed with the HTML skilled employee. A few examples would be fixing a broken email signature, informing your clients by displaying page mentioning servers under maintenance and much more. It is equally vital for employees to possess knowledge on search engine optimization techniques. Marketers or web site developers handle these techniques to enhance their marketing by increasing the visibility of web pages. By enhancing the visibility of web pages, ranking in search engine results is improved. When ranking is navigated to the top of the list effective and valuable traffic is directed to the web pages and company’s web page is prominent which thereby brings in more clients to the company. And hence SEO techniques are mandatory skills to be possessed by the employee. Making use of the various technologies is one way, whereas, writing them with appropriate words so that other professionals can understand is another talent an employee should possess. When messages are to be written for distributors, suppliers, customers, manufacturers and more, employees with technical writing skills are necessitated. Companies these days require storing a large amount of data, so saving data is vital. SQL has the capability to act upon with all databases and hence SQL is considered important in all organizations. With masses of data, an employee who is skilled in SQL can pick out the appropriate data components and further proceed in generating reports which in turn assists in the decision process. SQL skilled job seekers are thus required by employers. Skills such as ORM, SEM, and Ruby on rails, Drupal, HTML and more can be valuable when viewed on resumes. Technologies keep changing as new technologies keep arriving one after the other. For the same reason employers are looking for employees who are beyond the line. Qorvis communication, senior director Jessica Bayer mentions that she would look for candidates who list technologies which she is unfamiliar with. In terms of technology, being ahead of the curve is what employers are looking for. The art of selling is also included as a technical skill which an employee should possess for his particular work domain. The patience and skill to convey the positive points of the products are mandatory for people involved in sales. Getting linked with variety of people and walking along with their personalities and pitch is also a talent expected by the employers. This process is splendid as it allows the project to be broken into smaller tasks. Once this is accomplished, it is made easy to manage the projects and also eases work. These days, many companies are adapting Agile methodology for the purpose of project management. Tracy Cashman, who is a general manager in WinterWyman mentions that Agile methodology is flexible and also collaborative. Hence employers are looking for employees skilled in Agile methodology. The CEO and co-founder of Porch, Matt Ehrlichman suggests that every team member must be aware of coding in spite of the job title they hold. Though they aren’t a developer, coding should be a skill they should possess. When you possess coding skills in your resume, this makes you stand out of the rest and also lures the employers to hire you. Coding skills are hence expected from the employers. To manage large data sets which possess a variety of data types big data analytics has played a major role. The analytical hunting from big data analysis can assist in customer service, effective marketing, and benefits over a rival company and lot more. And so employers are looking out for applicants who can deal and bring out real value data by ways of data analytics. By this way enterprise risks are coped. There are many fields where conversion to digital programs is mandatory in present scenario, in the same manner online systems also requires highly demanded user experience designs to be followed. In that manner HTML, JAVA scripts, ADOBE are beneficial. Employers are expecting employees to possess all these skills to get recruited immediately. Information security system professionals are highly in demand these days. CEO of logical operations Bill Rosenthal mentions the same and the importance for security professionals. Mobile application development security professionals are highly coveted particularly. Although enterprises have developed ways for secure mobile development, an enhanced security is mandatory for mobile applications. The risks involved in this field for security has escalated and hence mobile security skilled employees are in demand. Cloud computing is the hottest technical skill discussed everywhere. Digitization of data is accomplished, where details and applications are found in cloud computing. When an employee is skilled in cloud computing, data security is assured and costs are also slashed for the company. Hence employers are looking for candidates skilled in cloud computing. Another highly demanded skill from employees is the data visualization. The main reason for data visualization is to formulate new ways to represent data in a creative manner. Visual representation of information is used to discover new information. Hence an employee skilled in data visualization can be in high demand. The tendency to solve technical issues for staffers and assist help for technical issues is another highly demanded skill employers are looking for. An experience at technical help desk can help you obtain another job of the same category when you possess an enhanced knowledge in the same field. Employees are looking for candidates who possess the right skill for their industry. A database administrator is one who is highly demanded in any organization. Handling massive amount of details and knowing the detailing about how the database has been drawn together is vital. A database administrator should possess skills in handling and taking complete responsibility of the network within the boundary. Employers are looking for skilled people who can handle the administration. 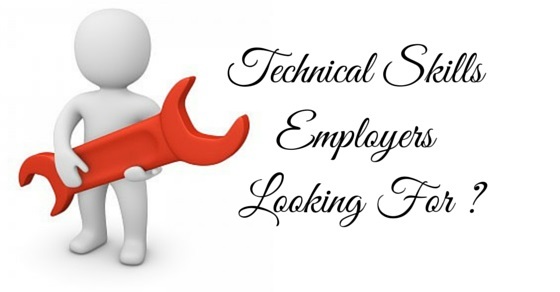 You can impress the employers by making use of technical skills by listing them down. Apart from being certified, making use of them in various projects can be an added advantage. The hiring managers are also keen on picking candidates with the latest web development technologies and other fresh new technologies that have popped up. Leave behind the industry you work for, but make sure to know your path way and stick to the latest technology. Technical skills are mandatory to land up with a job quickly. When you possess in-demand technical knowledge, you signal the employer that you’re aware of the latest technology around. By this way you also convey that you can pick up and adapt to new technologies followed in the establishment. Irrespective of the industry, updating yourself with the latest skills is mandatory to stand out of the crowd and stay demanded.